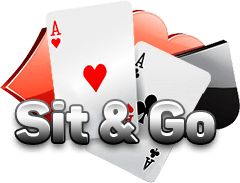 The online Sit & Go (SNG) games are a popular choice for many cyber poker players. 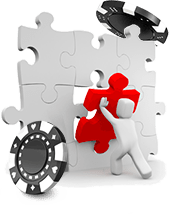 Let's take a look at a strategy for the typical No Limit game with the common "three-places-paid" payout structure. 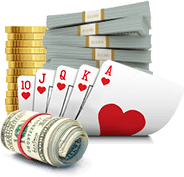 In our game we'll assume that first place pays 50 percent of the buy in, second place pays out 30 percent, and third pays 20 percent. This payout structure leads us to our first strategy decision. That is, are we going to be playing to finish in the money or are we playing to win? Some will argue that we must play for first place. They would argue that only the larger payoffs will enable us to be a net winning player. The buy-in includes a steep rake for the house, they argue, and only by playing to win can we overcome this charge. For example, in a $10 SNG the poker room may charge you $10+1 with the house keeping the dollar. This is over 9 percent that goes to the house. Larger SNGs usually have slightly smaller charges but they are still significant. In our example a first place finish pays two and a half times more than a third place finish. That justifies taking some risks. Playing for first early on means playing more aggressively. 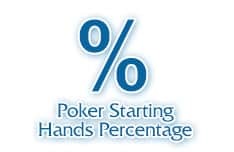 It means taking chances early on in an attempt to build up a large chip stack. With the large stack you can control the action. You can push people around and put them all-in. Sometimes things will go your way and you'll find yourself sitting on top of a pile of chips. Other times this more risky strategy will leave you crippled or out of the tournament early. Proponents of the "play-to-win" strategy don't mind busting out of a SNG early. They figure that it's better to go out early and just get into another game than to lose out on the bubble, wasting all that time and effort. Other players play to get in the money. If they make it to the cash, they reason, then they can try to move up. These players will tend to lie low and avoid the action early in the tourney. 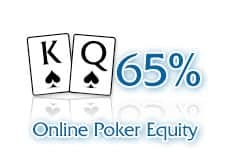 They want to avoid the aggressive action that can break out at the beginning of the SNG. The "finish-in-the-money" player is seeking to shorten her odds by letting the other players take each other out. She reasons that if one or two players make a quick exit, that significantly helps her chances. Furthermore, one of the players eliminated early might be a powerful player who just suffered a bad beat. A player using this strategy tries to cultivate a tight table image that she can later exploit. So the mantra of a "finish-in-the money" strategy could be, "Don't gamble early." So which strategy should you adopt? 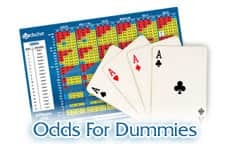 Like most decisions in poker the answer is "it depends." Online SNGs are unique in that we don't have much of an opportunity to engage in table selection. Typically, when a table opens up for registration, there is a "land grab" for any available seat. We don't get the luxury of observing a table for a round or two like we do at a normal ring game. We have to figure out our opponents on the fly. If you play regularly, your notes can be a great help. But usually the first few poker hands will be a learning experience. Who are the aggressors and who are the maniacs? Who is sitting out the early action? Is this an aggressive table or is everyone playing tight? What's my position relative to the aggressors? If you find yourself in a crazy game where several players are going all-in in a suicide pact, that's great. Sit back for awhile and let them chew each other up. You are hoping that several of these guys make a quick exit. The blinds should still be relatively low and you'll have plenty of time to pick your spots. 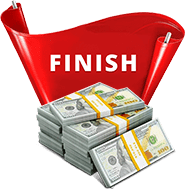 Your chances of finishing in the money are good. If you find yourself at the other extreme and no one is stepping out of line, seek to take charge of this type of game. Look for opportunities to play your opponent more than the cards. You're going for the gold in this type of game. Most games will require tactics that mix the two basic strategies. As an example, last night I was in a SNG that was very aggressive at first. Four players were strongly contesting each pot. I chose to sit back and really picked my spots. I managed to stay pretty much even, lurking around third or fourth place. After about 25 minutes, the character of the game changed. Two of the aggressive players were eliminated. The other two had accumulated large chip stacks. At this point, it seemed none of the remaining eight players wanted to play aggressively. The two big stacks seemed content. The other six of us were slow to recognize the new situation. Finally, I picked up on the new situation and started picking up some easy pots. As with most games, the character of that game changed several times. Each time it was important to recognize the change and adapt. The default strategy that I feel most comfortable with is to play conservatively early on. Don't gamble; instead play very tightly. Wait for the field to thin. As you near the bubble, use your tight table image to play aggressively and steal a few pots. Your opponents may be reluctant to contest a pot and risk busting out on the bubble. 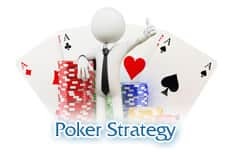 But also recognize that this strategy now widely espoused by the better SNG players, which means you may need to take your tactical thinking to another level if someone else is aware of what you are up to. So, while I'll enter the game with a basic thumbnail strategy, I think the important point is to not get wedded to either SNG objective. A good businessman will ask himself every day, "What business am I in today?" He knows that conditions and opportunities are ever-changing. He must adapt in order to survive and to thrive. Perhaps SNG players should ask themselves a similar question: "What type of game am I in right now?" Asking this question on an ongoing basis will point us in the right direction. Play for the win when conditions are right to do so. Play to place in the money when that's the best choice. 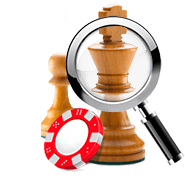 By being flexible and adjusting our objective when needed, we can enhance our SNG play and boost our win rate.